When it comes to upscale fine dining in Niagara one of the first names that comes to mind is Treadwell. Chef Stephen Treadwell’s reputation for tantalizing the senses with fresh, seasonal ingredients has made him one of the most celebrated and respected chefs in Canada. When Treadwell opened his first restaurant in Port Dalhousie some thought he was crazy. In my review of the now closed location I stated that if anyone could make it there, Stephen Treadwell could. The restaurant was, undeniably, a huge success. Treadwell’s decision to move caught many by surprise, and, even though Treadwell issued a well-timed news release, the rumours started again. The move to the town of Niagara-on-the-Lake, to a much smaller space, allowed Treadwell to start with a clean slate. After two visits, I am convinced that this decision was also a sound one. 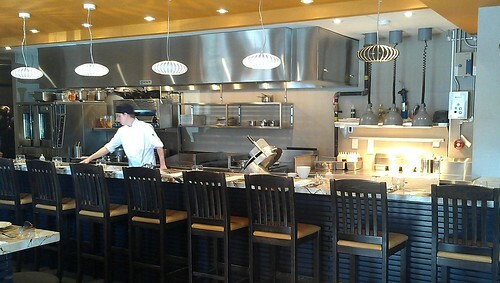 An open concept design affords diners the option to watch the chefs in action and dishes are tweaked, or even replaced, to match the season and to showcase the best ingredients available at the time. 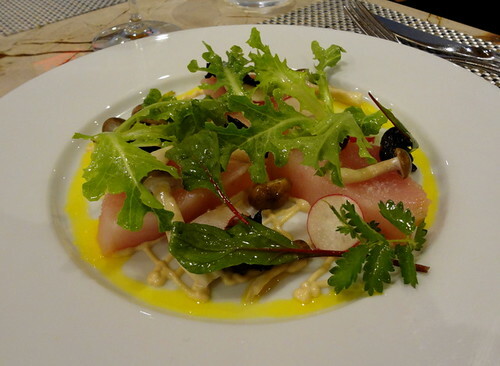 Since the time of our visit, the melt-in-your-mouth sashimi of British Columbia albacore tuna (photo below) we tasted is now offered pan seared but garnished with the same pickled mushrooms — a winning dish in either incarnation. 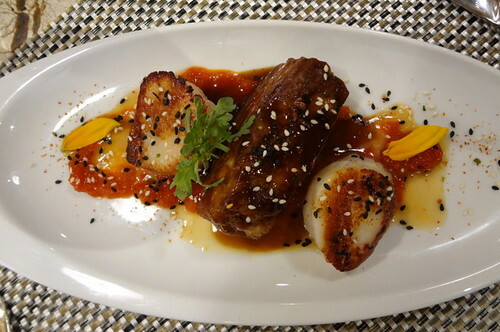 The seared sea scallop with hoisin-glazed pork belly is a study in the careful marriage of flavours and textural elements. Sweetness, salinity, richness and delicacy work together in harmony here. This is a dish where I defer the wine selection to James Treadwell. He knows the dishes and you can trust his palate to select something that elevates the food to the pinnacle of pleasure. Andrzej Lipinski’s Big Head Chenin Blanc is a killer match with the dish. 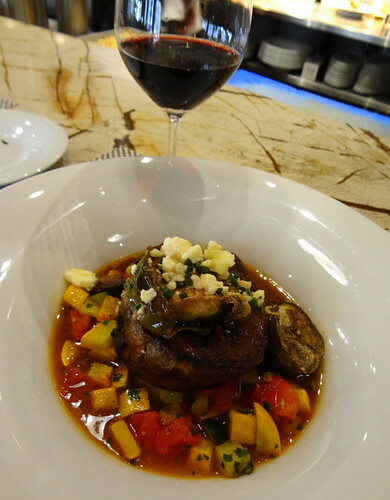 My main dish during this first trip to the new location is a succulent braised lamb shoulder with ratatouille, eggplant and feta cheese (photo below). Textural contrast between the moist, tender meat and the tender-crisp vegetables is perfectly executed. One of my favourite Treadwell touches is the way the sauces are reduced to a rich, naturally complex, syrupy consistency — never heavy or over thickened. James Treadwell’s wine selection for the lamb — Leaning Post Merlot 2010 – with its dark fruit and soft tannins is a superb compliment to the savoury character of the dish. 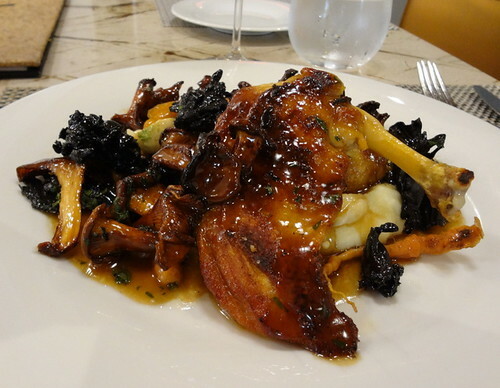 A dish of confit leg of chicken, served with black trumpet and chanterelle mushrooms (photo above), marries beautifully with the earthy, truffled potato puree. This is pure comfort food of the highest order. For dessert, chocolate cake with poached pears, salted caramel ice-cream and toasted hazelnuts (photo below) would make any sweet lover swoon. For a self-confessed cheese-head like me, a cheeseboard (photo below) paired with wine does the trick. 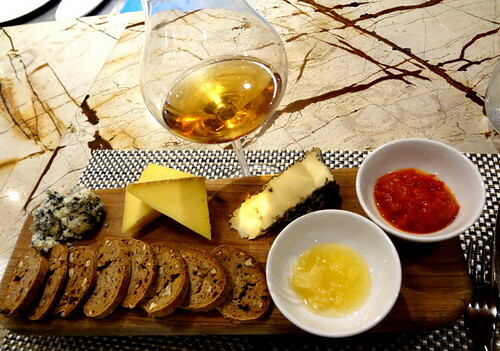 Treadwell’s stellar wine list ensures no shortage of dessert wines and, again, have some fun and let James choose based on your selection of cheeses. 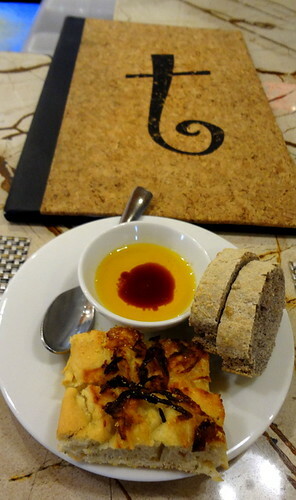 Dining at Treadwell’s is a special treat. Impeccable cuisine, top-notch wines and exemplary service combine to create an incredible experience. 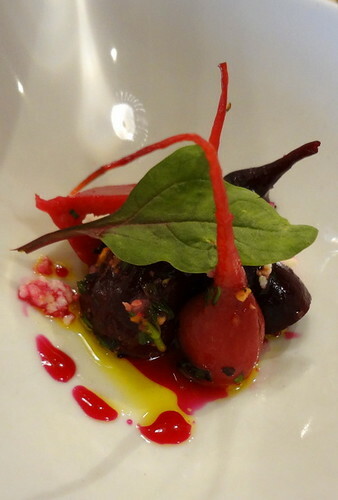 A three course dinner for two, with wine, will average $115- $150 depending on selections. Metered, on-street parking is available. Click here for a parking map of the town along with rates.